Disclosure: I received a gift card as compensation for this post. Opinions expressed are my own. Now that we are back in Ontario, I anticipate a few shopping trips to Ottawa in the near future. One place I’m looking forward to checking out is Target! My mom raves about shopping at Target and says she always makes a point of going there when she is in the area. Today I wanted to share with you some information about Target Pharmacy and how it can be your one-stop shop for all your health and wellness needs for your family. Did you know that Target Pharmacy has a pharmacist always available to answer your questions? I know for me this is a big perk because I’m always a little nervous about new medications, even the OTC kind. I like to get professional advice to choose the right product and know all my options before deciding on what to purchase. I also find it helpful to speak to a pharmacist when either I’m prescribed a new medication or my children are. I want to know how it should be administered, dosage and most importantly, what side effects to expect if any. Knowledge is power! I like that Target Pharmacy gives you easy access to professional advice. My Organized Chaos , Common Cents Mom and Mommy Kat and Kids recently shared their experience shopping at Target Pharmacy. They picked up some health essentials and are stocked up and ready for summer. That is something I still need to do. I guess I better get on that! Next time you’re shopping at Target, head on over to their pharmacy to look around or talk to a pharmacist. Visit the Target Pharmacy webpage for more info. Thanks so much for the link, Stacie, hope you love the store just as much as your mom does. I’m considering switching my prescriptions to Target right now. I do enjoy Target’s pharmacy section and I like there there is always a pharmacist available! It’s great that they have a pharmacist on hand, and I really like the medical history factor. My daughter will have to check into this. I hate when you get a new prescription and aren’t told anything. It’s scary some of the things you need to know but have to research yourself. Stay well this summer! There’s a new Target in my neighborhood, I will check out their pharmacy! A Target just opened in my town and so far their over the counter pharmacy products seem to cost less than other stores. I like that they will text you when your prescription is ready to be picked up. 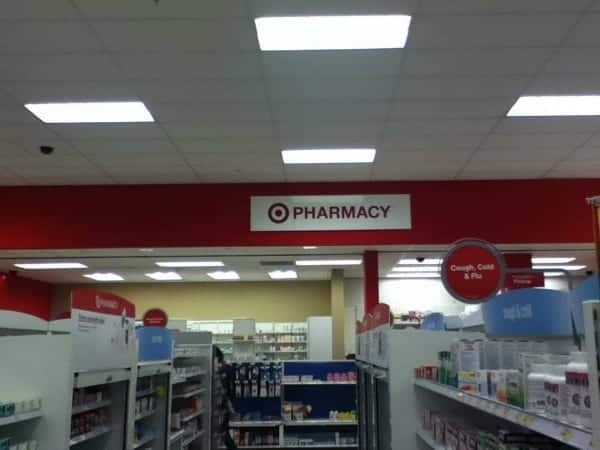 I really had no idea Target had a pharmacy! This is great! I don’t go to Target often, but I might go a little more frequently now that I know about the pharmacy! Target is building a new Supercenter by my house!! I am so excited and I will be transferring my prescriptions to their awesome pharmacy. They have a great reward that if I get 5 prescriptions filled that they will give me 5% off of my daily purchase. Only been to a target store onew time .